As the weather warms with the coming summer, it’s almost as if we come out of our winter hibernation and seek out activities that let us socialize and get outside. Golf can be a great way to socialize, enjoy the nice weather, and get some exercise while you’re at it. Provided you forgo the cart and carry your clubs, walking a full 18 holes is enough to get the heart pumping and benefit your cardiovascular system. Unfortunately, most of us aren’t playing golf for a paycheck. Our day jobs require most of our attention, and we golf for pleasure when we can. But if your day job involves a lot of sitting, you may be experiencing some problems on the course. 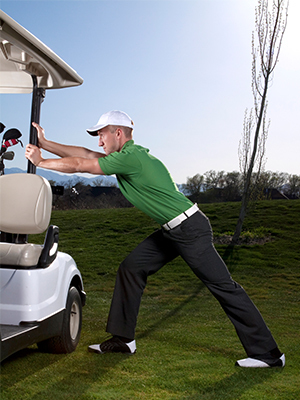 Sitting for long periods of time can wreak havoc on your golf game. Hip flexors get tight and make it difficult to get your hips around, lats lose some of their flexibility and limit your follow through, and your core gets lazy, decreasing stability and ultimately affecting your stroke mechanics. All is not lost though. Regular stretching of these three key areas will help keep you limber, lithe, and killing it on the course. Hip Flexor Stretch - Sitting at a desk, or in a car for any extended period of time is like kryptonite for your hip flexors. The shortening of this muscle can lead to lower back pain in the short term, and knee issues due to decreased neuromuscular connection in the posterior chain over the long haul. Your golf game suffers too as your hips struggle to reach full extension during the latter part of your swing. This limitation can pilfer power from your swing and curtail momentum. Action: In a kneeling position raise one leg and place that foot on the floor so both of your legs are bent at 90 degrees with the sole of one foot on the floor. With your trunk upright, lean forward pushing out from the hip until you feel a gentle stretch on the inside of the top of your kneeling leg. Hold the stretch for 20-30 seconds and release. Repeat on the other side. Action: Find a surface that is about shoulder height. Extend an arm out straight and lay it on top of the surface just above the wrist joint. With your palm facing inward and your thumb facing up, gently lean forward at the hip bringing your head closer to your arm until you feel a stretch along the side by your armpit. Hold the stretch for 20-30 seconds and repeat on the other side. Side Stretch - If your core is compromised you’ll want to look into some core training, but in the interim you can limber up your sides and increase range of motion in your trunk by including a side stretch in your repertoire. Keeping your sides limber will help improve your follow through, and prevent injury. Action: Stand with your feet hip width apart and raise your right arm up by your ear with your palm facing forward. Slowly lean to the left stretching your right side gently, and hold for 20-30 seconds. Repeat on the left side. A little stretching goes a long way in the great game of golf, and if you’re planning on getting out in the sun to enjoy a game or two this summer, it’ll be in your best interest to prepare your body. Flexibility and balance will help you enjoy your golfing experience more, and you might even take a few strokes off your game!